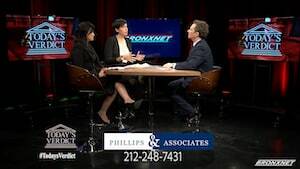 Two attorneys from Phillips & Associates, Siobhan Klassen and Irene Chan, appeared on the show Today's Verdict, hosted by trial attorney David Lesch, to discuss wage and hour law. Our New York City employment lawyers explained the main rules and exemptions related to wage and overtime laws. Our attorneys explained that overtime includes any hour worked in a workweek that goes beyond 40 hours. Any hour worked over 40 hours in a workweek is supposed to be compensated at time and a half. However, not every worker is entitled to overtime. There are three major categories of exemptions in which a worker does not need to be paid overtime: professional, executive, and administrative. A professional exemption would apply to people who have a higher degree or advanced learning. Often, lawyers, doctors, chemists, and biologists are exempt. Creative professionals are also exempt. The second exemption is the executive exemption. This applies to people who manages a company and possess the authority to hire and fire. They must be in charge of a minimum of two full-time employees. Your job title alone will not determine whether you fall under the executive exemption. An attorney would need to look at all your primary duties, how broad your duties and tasks are, as well as how important your decision-making is. The administrative exemption applies to people who do office or non-manual work that directly relates to the operation, business, or management policy of the employer. For example, someone in HR or finance who has huge discretion and authority over company policies and hiring and firing would fit into the administrative exemption. An employer cannot exempt an employee under the administrative exemption by simply giving them a certain title and salary. If the person does not have the authority to make key decisions, the title itself will not make them exempt from being paid overtime under the administrative exemption. New York overtime time laws can be complicated. It may be helpful to discuss your failure to pay overtime claims with a New York employment lawyers. We offer free consultations and work on a contingency basis. Our attorneys also discussed tipped wages. People who are earning primarily tips do not need to be paid the full minimum wage; instead, an employer can pay a tipped wage which is less than the minimum wage. The tipped wage assumes that you will get tips to make up the difference to bring you up to the minimum wage rate per hour worked. For example, if no customers come to the restaurant where you work, you would still need to get paid minimum wage. The employer has an affirmative duty to pay attention to what you are getting paid to make sure that you get at least minimum wage. Employers must keep records; failing to keep records is likely to result in the court believing the employee over the employer. If you are concerned that you are not getting paid your proper tipped wage, you should approach your employer about your concerns or discuss your situation with an experienced New York employment lawyer. If your employer is not paying you the proper amount of overtime wages, our attorneys can try to resolve the situation on your behalf. You are protected from retaliation for asking about whether you are being paid properly or expressing concerns about improper payment. Retaliation can be an additional and/or a separate claim. It is a protected activity to complain in good faith about whether you were paid your proper wages. However, when you complain about unpaid overtime, you need to be specific. You should also put your complaint in writing and keep a record of your complaint. Sending your complaint via email and also blind copying yourself is a good strategy. If your uncomfortable complaining yourself one of our employment lawyers in New York can assist you. We also have employment attorneys in Long Island, and Westchester. Our attorneys noted that the State of New York and New York City are among the most expensive places to live in the country and likely the world. Rents are spiking, and even $15/hr. is not enough for lots of people. It is crucial that you be paid the proper minimum wage if you work in New York City. When people work hard, they deserve to get paid for it, particularly since there are firm rules set forth about how much you should be paid at a minimum. In New York State, you have six years to bring a wage and hour claim. If your employer is violating the wage and hour laws and goes through trial, the court will automatically award liquidated damages. Liquidated damages are double your back pay. If you were owed $20,000 in unpaid overtime, for example, the liquidated damages would be $40,000. You are also entitled to attorneys' fees. If you need to sue your employer for unpaid wages, our highly experienced employment lawyers can provide aggressive legal representation. Call Phillips & Associates at (212) 248-7431 or contact us through our online form for a free consultation. We handle employment litigation in the Bronx, Queens, Brooklyn, and Manhattan, as well as Westchester, Suffolk, and Nassau Counties, Pennsylvania, and New Jersey.